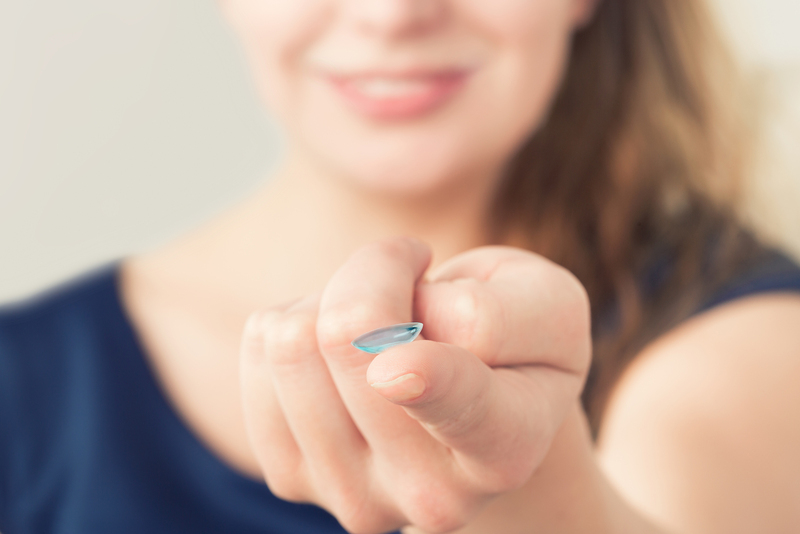 As a first-time wearer of contact lenses, there’s a lot to be aware of and get used to. Not only do you have to adjust to having something in your eyes feel, but you should learn when to remove them and how to clean them. We get common questions about contact lenses during a patient’s visit, so we have gathered useful questions and answers that will help benefit you. Are contact lenses covered by insurance? It depends on the health insurance plan you have. Remember, some insurance plans require separate vision plans. Call your health insurance provider for more information. Which types of contacts are ideal for me? Your lifestyle plays a key role in choosing which type of contacts to get. If you’re busy and don’t have much time for cleaning your lenses, dailies are best. You can just dispose of these each night. Two-week disposables and monthlies are also available. These are worn for longer periods. Certain types of contacts are better at treating farsightedness, nearsightedness, and astigmatism. Do my hands always have to be clean when handling contacts? Yes, definitely. You must always wash your hands with soap and water. Lather up and dry your hands completely. If you touch your contacts or your eyes with dirty hands, you could give yourself an eye infection. The contact got stuck. What do I do? Don’t panic. This does happen from time to time. Use rewetting drops to ease in taking out contacts. You should also make sure your hands are dry. That will allow you to get a better grip on the contact. What do I do with my contacts after I take them out? If they’re daily contacts, dispose of them in the trash. If they’re two-week disposables or monthly contacts, clean them using a contact lens cleaning solution, these can then re-wear them the next day. Is it normal for contacts to feel uncomfortable at first? Yes, it is. You’re adjusting to the feeling of something new. You may notice dry eye and headaches, but these generally go away within a few weeks. If you’re having other symptoms, contact your eye doctor. Can I wear contacts while swimming? If you’re going to get wet and expose your eyes to water, it’s best to take your contacts out. This prevents eye infections. To be safe, remove contacts when swimming, bathing, and showering. If you are going to the gym, playing sports, or engaging in other physical activities, you can keep your contacts in, but make sure to avoid getting sweat in your eyes. Can daily disposable contacts be worn more than once? No, dailies shouldn’t be worn more than once. These are meant to be disposed of after one use. If you need reusable contacts, there’s always two-week disposables and monthlies. Those are meant to be re-worn multiple times. I forgot to take out my contacts last night, what now? It’s not advisable to keep contacts in overnight. This could lead to eye infections. However, it does happen, especially at first when removing contacts isn’t yet a habit. If you forgot to take your contacts out last night, remove them immediately. If they’re two-week reusables or monthly contacts, clean them using a contact lens solution, and put in fresh contacts. Make sure you monitor your symptoms, if your eyes may be sore and it persists, contact us. At The Plano Eye Care Center, we help fit our patients with contact lenses and prescription frames. We also offer comprehensive eye exams for the whole family. Led by Dr. BJ Patel and Dr. Gulrez Khoja, we treat keratoconus, astigmatism, dry eye, and more! Schedule An Appointment For A Contact Lenses Exam! To schedule an appointment with our eye doctors today, please call 972-964-3937. You can also visit us at The Plano Eye Care Center on 4104 West 15th Street #100 in Plano TX.